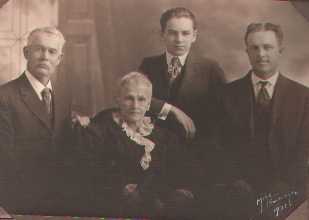 This is a picture of four generations of Weltys : Ann Frances (Watkins) Welty, her son Christopher Bennett Welty, his son Richard Emerson Welty and his son Donald (the brother of Harriet's father Paul). They are identified by their Stradonitz numbers (first column on the following chart). 3 Harriet WELTY (see her bio) 11/11/1945 IA see the page "cousins"
6 Paul WELTY 26/1/1907 IA 30/1/1961 Mex. 192 Joseph WELTY 1778 PA ? N.B. This is an excerpt from the completed family tree; "continued" means we have more information about the ancestry of this person : see the complete family tree. Click here for more details about the Weltys. 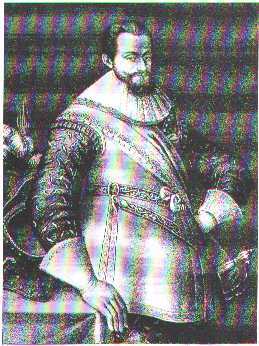 The Schenk line connects us to the illustrious Schenck family, including the abominable Marten Schenk van Niddeggen (picture) a General in the Dutch War of Independence. According to Motley in History of the United Netherlands, he was so cruel that sometimes he would force a person to climb up a steeple and jump off of it. Not surprisingly, his own end (1589) was gruesome: cut into pieces and pickled, his various body parts were spread out and displayed on the walls of Nimeggen. 3 Harriet WELTY 11/11/1945 IA see the page "cousins"
3632 Marten SCHENK 7/8/1584 Holl. ? N.B. This is an excerpt from the completed family tree; "continued" means we have more information about the ancestry of this person. My two grandfathers and one grandmother came from Auvergne. This region, in the center of France, is known for its cheese, its landscapes (it is a chain of extinct volcanoes, some of them spectacular) and its hard-working (sometimes cheap....) inhabitants. It is also known as one of the poorest regions in France and a country of emigration to Paris. Like thousands of others, my two grand fathers, the youngest of the family, had to emigrate to make their living in the capital. Family history says that my paternal grand-father hated the priests his whole life, since his minister convinced him to leave the country with only a few coins in his pocket, in order to protect the inheritance of his sibblings. In Paris, he became a house-painter and, with the help of my father, the owner of several wallpaper shops in Paris. The Rochefort line began in Bromont - Lamothe, a small village in Auvergne - and goes back to the Neanderthals! 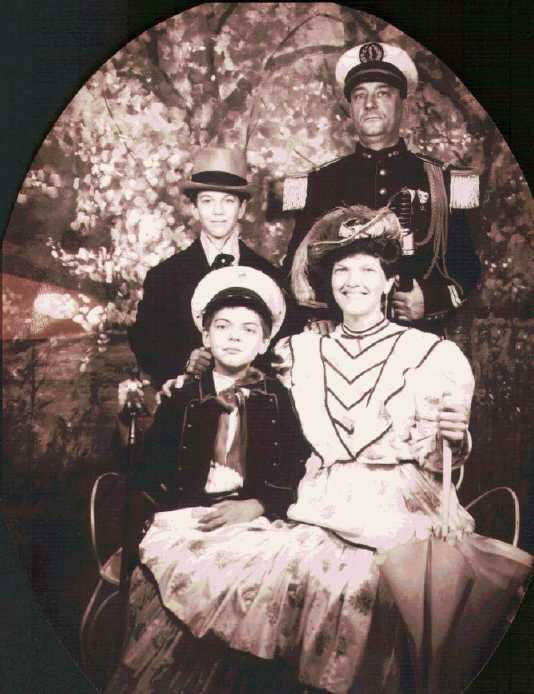 Introducing the Rochefort family in 19th century dress in the 1990s : Front row: Harriet Welty Rochefort and David. Back row: Philippe Rochefort and Benjamin. This picture, taken about twenty years ago, looks so authentic that many people think that these are OUR ancestors. Mais non - c'est nous! 2 Philippe ROCHEFORT 3/8/42 Paris see my resume and the page "cousins"
128 Gilbert ROCHEFORT 4/8/1726 Bromont-L 4/10/1773 Br-L.
512 Antoine ROCHEFORT Bromont L.
513 Jeanne GEILHE Bromont L.
1024 Pierre ROCHEFORT 1657 Bromont-L. 29/5/1743 Br-L.
4096 Martin ROCHEFORT 1604 Bromont-L. Br-L.
For more details, including some website addresses by other researchers, see our surname list. For family pictures, click here. For ancestors who arrived in the early 17th Century, click here. For my missing links, click here. For books by or about my ancestors, click here.